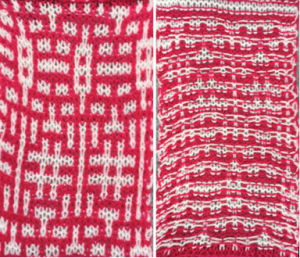 My previous posts on using gimp to generates charts and images suitable for knitting: 1, 2, 3, 4 . I am working in Mac OS 10.10 now, so there may be some variations in results from earlier OS or for Windows versions users. 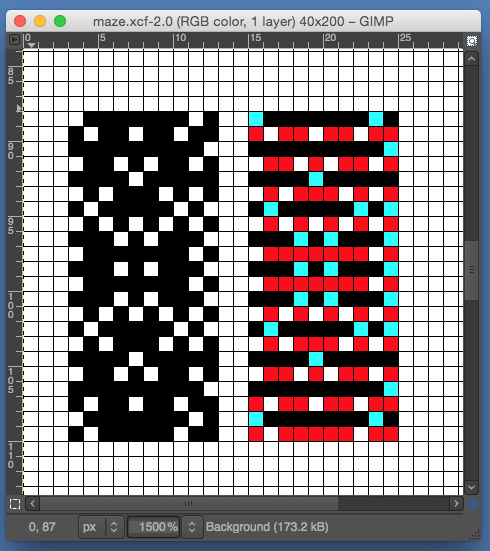 drawing a vertical line in non pertinent color to border areas having several rows with no second color present, as seen below, may help define end or start of selections when attempting to invert colors. Color invert may be achieved in RGB mode, not indexed. Below the inversion occurs on “even numbered” every other rows. 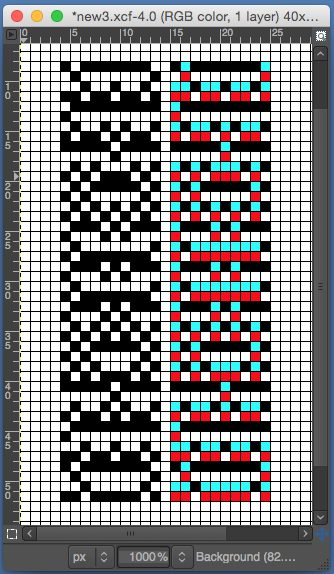 The program in my OS now showed the previously red squares in blue, the alternate squares in black. 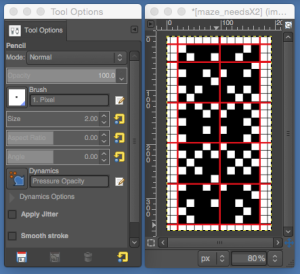 After using color invert, non pertinent color (blue) may be erased (using pencil tool, each square on grid is a single pixel) as well as those yellow “border” squares. 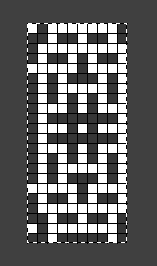 In the image below the black squares on the left represent all holes that will be punched out in card. 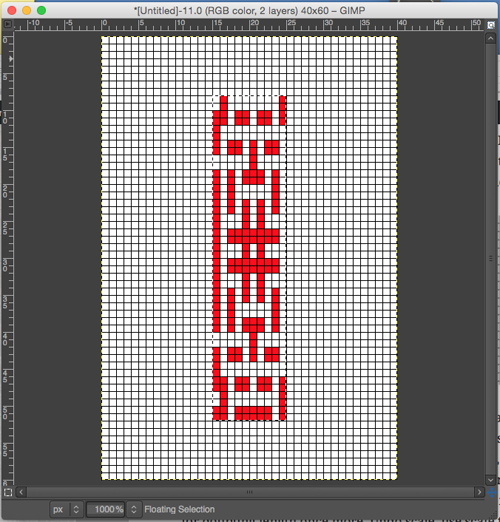 One drawback in this program, because of the scale using single pixels, is that no text to include row numbers, etc. is possible. The final repeat is 10S X 44 R.
If one wants to avoid using double length in the automated machine settings, the image of holes to be punched may be doubled in length. To do so color mode needs to be changed to indexed (4 colors) to retain image clarity. 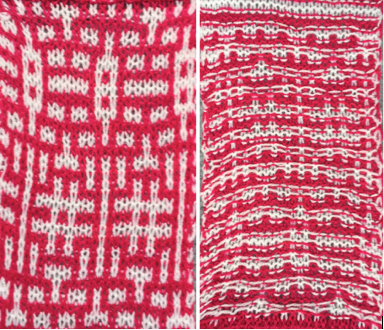 Maze and mosaic knitting, my previous posts: drawing motifs, from design to pattern (Excel), from pre punched cards, and references and pubs. 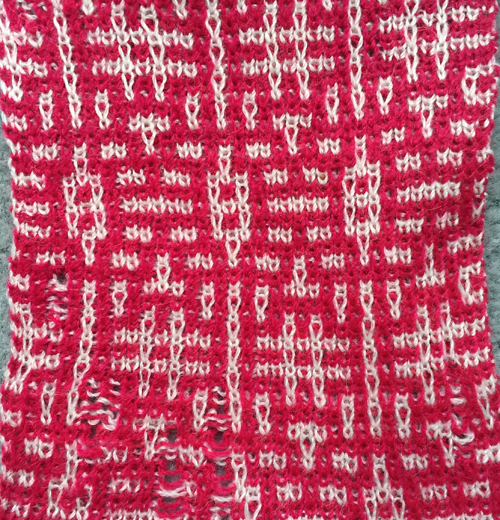 The repeat worked out for slip stitch, and edited down to 2 colors. 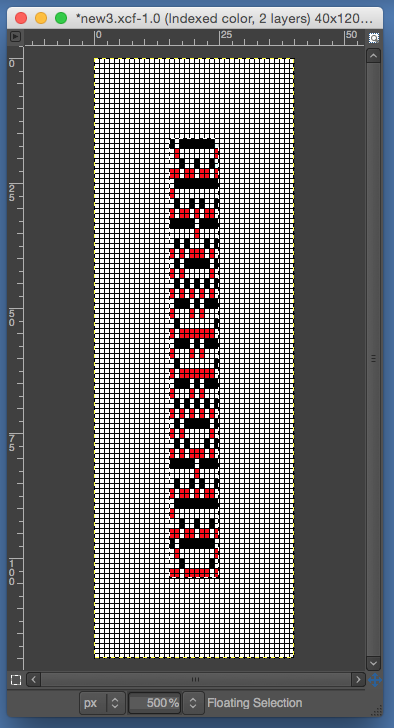 Again, the black squares on the left represent all holes that will be punched out in card. To further mark the repeats in blocks, making chart easier to follow in absence of numbers, the subject of drawing straight lines comes up. Most of the online tutorials for using gimp are for its Windows version. The pencil tool may be used. Normally, tool options are displayed in a window attached under the Toolbox as soon as you activate a tool. If they are not (Mac), you can access them from the image menu bar through Windows → Dockable Windows → Tool Options, which opens the option window of the selected tool. In theory “Ctrl:This key changes the pencil to a Color Picker. Shift: This key places the pencil tool into straight line mode. 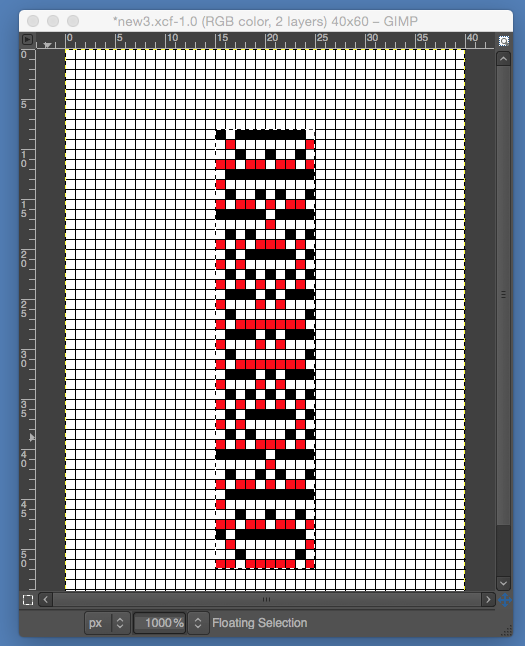 Holding Shift while clicking Button 1 will generate a straight line. Consecutive clicks will continue drawing straight lines that originate from the end of the last line.” On my Mac I worked out this method: first select color and pencil tool. Place a pencil dot where you want the line to start. If you press the shift key, a cross hair will appear, press the command key in turn as well for straight line mode, click where you want the line to end. 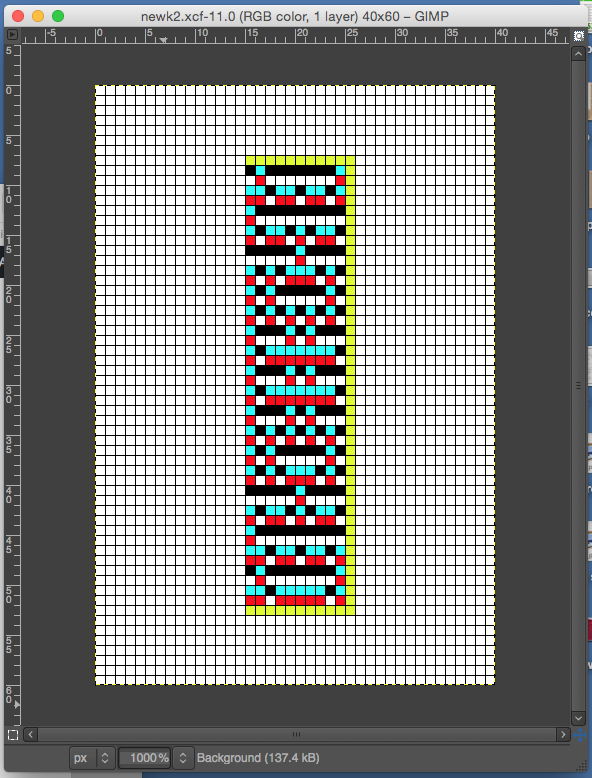 Consecutive clicks will continue drawing straight lines that originate from the end of the last line. Pressing both the shift and the command one at once after the initial pencil mark will call up the color picker and require a color selection and an OK. 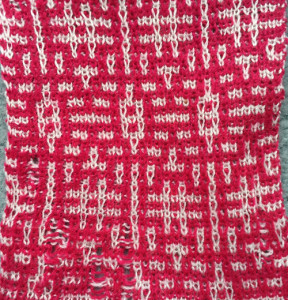 The dropped stitches were a problem when using the ribber on one of my two 910s, that adventure can be the topic for another post.